As usual, I am running late with my monthly ‘share & tell’ so please forgive me as I combine April and May together. Thanks for this tip Melanie. I find the best way to prevent the thread from breaking when gathering thicker fabrics like denim is to loosen the thread tension on my sewing machine, I go down as low as between 0-1. This allows the thread to be pulled to gather the fabric much easier so you may like to give this a try next time. 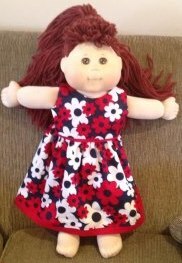 Looks like Tahlia’s Cabbage Patch Kid doll is all set for summer with these cute summer dresses and summer nightie. 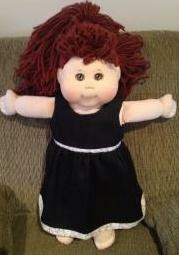 When Ruth is not looking after her 1 year old grandson, she loves to make doll clothes for her granddaughter. Here she has made a lovely skating outfit using my one piece swimsuit pattern and some Lame for the skating skirt. 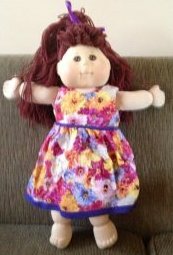 Ruth says, ‘I’m sure another knit would be better (for the skirt), but not as pretty’ and she also feels that there should be an opening at the back of the swimsuit to make it easier to dress the doll. I find Velcro tends to pull the Lycra/Spandex thread really easily so prefer not to have the back opening but if you find it necessary to have the opening, this would be easy enough to do. Firstly, fold the back pattern piece in half and add a ½ inch seam allowance along the straight edge, cut two pieces of fabric. Sew part way up from the crotch and then join the front and back pieces together at both shoulder seams. Then add the elastic by starting and finishing at the back neckline, attach the elastic at each armhole and then stitch the crotch seam. Lastly, attach the Velcro strip in the back opening. 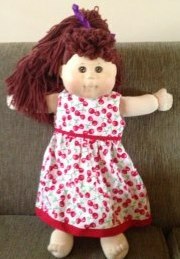 Lynne is an Aussie grandmother who enjoys making doll clothes for her granddaughter living in the US. She is ‘finding a lot of pieces of fabric from the “olden days” in the cupboard’ and has made this gorgeous little layered ‘party’ dress using my summer dress pattern and some broderie anglaise she has had since her girls were little. Lynne also embellished it with velvet ribbon, sparkling button and a bow at the back. To finish the outfit, Lynne made a headband and shrug for the ‘cooler days’. 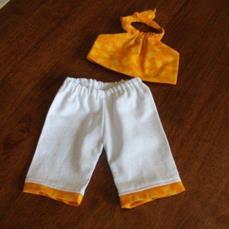 She has also made some lovely summer capri pant and halter top sets…. Chris is a fellow Aussie who has just ordered herself an Australian Girl doll and has been busy sewing a new wardrobe for her while waiting for Belle to arrive. When making the halter top, Chris aligned the big flower so it sits in the middle and did the same with the other side but with a big light coloured flower which will make it great as a reversible top. She also made a little over-shirt in case Belle gets a little chilly LOL. 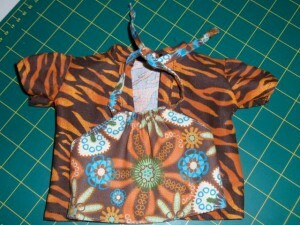 Thanks again everyone for sending in your photos and sharing your experiences sewing doll clothes. 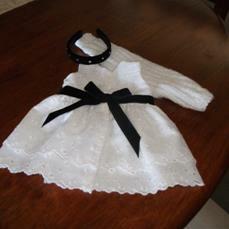 Thanks so much, Rosie, for featuring ‘Kit’s Couture’ here. And thanks too all of you who have clicked through to take a look! It’s lovely to share my projects with you all. I’m so glad I discovered your site and I’m really happy with how easy your patterns are and love love love your videos too. No matter how much we know and sew there’s many great tips you share with us to help make sewing dolls clothes that much easier. Thanks as well for sharing the pic of the reversible halter top I made for Belle… She loves it and it looks so cute on her. Hi Chris, I loved reading your blog and finding out what you and Belle have been getting up to. It’s great to see you having so much fun with her and I love the clothes that you have been making. I’m glad you enjoy using my patterns and I look forward to seeing more photos of the outfits you make for Belle. Hi Bobbie, I’m pretty sure the leggings have been purchased but hopefully Ruth will let us know for sure. WoW those are REALLY well done!! I wish I could sew that well! 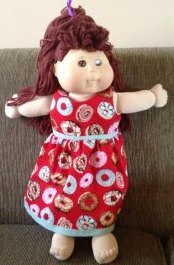 Hi I am new to this making doll clothes thing, but can someone please explain how to do the arm and neck holes neatly, Kathy. 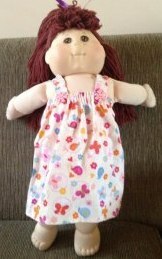 Hi Kathleen and welcome 🙂 The neatest way to do neck and arm holes on doll clothes is to line the top as it is much easier and quicker than making facings. It is certainly much neater than just turning the raw edges under. I notice that you purchased my course so you will have the bonus crop top pattern which is fully lined, perhaps you could have a look at how I do that pattern. I also do this when making dresses i.e. the whole bodice of the dress is fully lined. If you are adding sleeves or a collar you do not have to worry about this as you are attaching other fabric and the seam is hidden. Hope this helps. Thank you Rosie I did it and it worked a treat,I love it. Thank you also for replying quickly.